"Read my lips... No new taxes." "Saddam has weapons of mass destruction." "If you like your plan you can keep your plan." So, I guess that the statement is not the most ridiculous statement that I've ever heard, but it is in the top five. Second, for the last 20 years, students in the Fearless Presentations ® public speaking classes have put together thousands (cumulatively) of persuasive speeches that all lasted about five minutes or less. In fact, we create these presentations dozens of times each week. Here is the process that we use. The Secret to Persuading Your Audience is to Show them How They Will Get What They Want, If They Do What You Want. One of the first real self-help book that I ever read was How to Win Friends and Influence People by Dale Carnegie. Early in the book, Carnegie mentions that he loves strawberries and cream. He talks about how wonderful this dessert is. He then says, though, that when he goes fishing, he doesn't put strawberries and cream on the hook. Fish are much more into a wiggly worm. When we are trying to win over our audience, we often focus on what we want -- not what they want. This is a huge mistake. So, the first step, when designing a persuasive speech, is to find some way to synchronize what you want with what your audience wants. Then, focus your presentation on the latter. For instance, you may want your budget increased. However, the people creating the budgets don't want to increase your budget. So if you create a presentation called, "You should increase my budget," then the presentation coach that I mentioned earlier is absolutely right. You won't persuade anyone. However, if we stop and ask, "How will the organization benefit if my budget increased?" then your presentation content changes dramatically. For instance, let's say that I am a loss-prevention manager, and I need a bigger budget. Then I might focus my presentation on how to decrease shoplifting or employee theft. If I'm in human resources, and I need a bigger budget, I might focus my presentation on how attract a higher level of employee or how to decrease employee turnover. Although I love Carnegie's strawberry and cream analogy, it doesn't fit exactly. (In that analogy, the fish is going to get eaten.) A better analogy might be to feed a milk-cow hay versus strawberries and cream. The cow gets what she wants, and the farmer gets milk to make the cream. The first step is to determine the following: What Does My Audience Want? Provide Three Ways that the Audience Can Get What They Want. Once we have the want of the audience in mind, now determine a few easy ways that the audience can get those things. For instance, the loss prevention manager can show how investing $50,000 in video surveillance can reduce theft by $80,000 per year. That would be a no-brainer. A one-time investment gives us a return year after year. The technique that I use is to ask, "If I could only do one thing that will help the audience get this thing that they want most, what would be the absolute best way to do it?" Then, "What would be the second best way?" Finally, "What is the third best way?" A question that I am often asked about the process is, "Why three?" The answer is simple. It is hard to know exactly what the audience really wants. As a result, we have to do a little educated guessing. If we only put a single item, we run the risk of misconnecting with our audience. For instance, if one of the decision-makers is really anti-surveillance camera, we better have at least another option available. It's kind of like getting flowers, candy, and a nice piece of jewelry for your wife/girlfriend if you are in the doghouse. One will likely do, but your chances are better with a few different items. Prove to the Audience that They Will Get these Things. This is where many persuasive speeches fall apart. We lay out how the audience can get what they want, but then they don't believe us. I like to use car dealers as the example here. Go to three different car dealers and look at three different cars. If you ask the three salespeople about each of the car's warranties, you'll likely hear then say something like, "This car has the absolute best warranty in the industry." The fact that each of the three salespeople are saying the same thing about three different cars means that at least two (and probably three) of them are lying. However, if one of the salespeople pulled out a copy of Motor Trend and opened it to an article about the great warranty on that particular car, there is much more credibility in the statement. My favorite way to prove a point is to use anecdotal evidence. If you ever watch TV court drama, you will see attorneys objecting with "anecdotal!" That just means that the example given is just one, single situation that doesn't prove the conclusion every time. Why do judges not allow anecdotal evidence? Well, because it works. It is very persuasive. If you give just one real-life example, the audience will think... "Well, if it happened once, it is likely to happen again." So, a good car salesperson might say something like, "I just sold this same model to a realtor and her husband, and they traded in a five year old version of the same car. She mentioned to me that she puts over 30,000 miles a year on her car. She wanted the model because in the last five years, she only had to get the oil and filters changed. Of course, when you can back up the anecdotal evidence with additional proof, it works even better. "In fact, Motor Trend listed this model in their top five of most reliable cars this year." All that you have to do is give at least one piece of proof for each of your statements, and you will likely win over your audience. Need Help Writing Your Persuasive Speech? 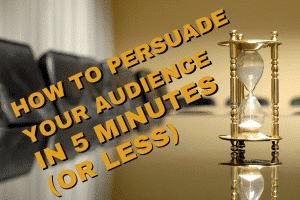 Need some help writing your persuasive speech? We have a free speech creator where all you have to do is answer a few questions, and the website will send you a quick outline of your persuasive speech. Click here to access the Online Speech Creator.